Donations make what we do possible. You may donate by check using the address on the right, or you can donate online using our Paypal account. Just start below. 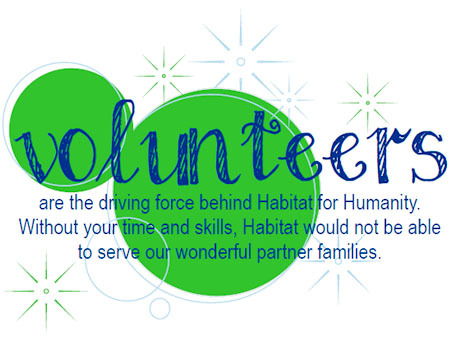 Volunteers are essential to the success of Habitat for Humanity and we greatly appreciate their partnership with us. Together our goal is to eliminate poverty housing in El Dorado. No prior experience is required to volunteer, just interest and enthusiasm. In addition to construction work, there are various committees that need volunteers, plus opportunities to help with fundraising or other special events. Put your talents to work at Habitat. We need you to make our community a more vibrant place to live.